Buying a used dirt bike is a great way to get into the sport without breaking the bank, but it has its risks. Especially if you are buying an unregistered dirt bike in a private sale. Always make sure you see some proof of ownership before handing over any cash. If it turns out that the bike has been stolen it will be recovered by the Police and it is YOU who will be out of pocket. If the seller has advertised the bike in “good condition” and even if it is a fair market value, the reality is that unless you know the seller and the bikes history, you have no way of knowing, it is a case of ‘buyer beware’. That said, most sellers aren’t out to rip you off, but it always pays to take the necessary precautions. Always do your homework and research online the make and model before you go and look at it. For the current market value (Australia) go to The Red Book. Type in the Make, Model and year and it will give you the ‘Private Price Guide’, ‘Trade In Price Guide’ and ‘Price When New’. Ask to see some documentation. Ideally, this would be the original purchase receipt. Any invoices for repairs and maintenance or parts to give you an idea of the bike’s history. If you buy a used dirt bike without the appropriate documentation, it becomes your problem. Buying a bike with the current registration documents and Roadworthy Certificate is the safest way to go. If the bike is road registered, it must have a Roadworthy Certificate (RWC) (Australia Only) to be sold, just like with a car sale. If the seller doesn’t have one, tell him to call you back when he has. The usual reason for not having one is that there is a bunch of things that need to be fixed. If you buy the bike “as is” without an RWC, the expense will be on you to bring it up to standard if you want to register the bike and ride on the road. Be aware that the RWC is valid for one month, so check the date to make sure it will not expire before you can do the transfer of registration documents. Getting it tested again may result in them finding more problems that were missed before, which you will now have to pay for. Why are they selling the bike? Ask the question. If the response sounds a bit evasive, or they fumble with the answers, say “no thanks”. Trust your instinct. Don’t be pushed into buying. If the seller says they have another offer, maybe they have, maybe they haven’t, but still take your time, it’s better than buying someone else’s problems. Trying to close the deal quickly is a common sales tactic, possibly to make you rush the decision in the hope you miss something. If you’re buying a motocross bike, obviously there is no registration, so insist on seeing the ownership documents. If they can’t produce them, walk away. If the price seems too good to be true, it probably is. It may have serious mechanical problems, or even be stolen. If the bike is at the approximate market value, consider making an offer 10% to 15% lower. They may tell you to get lost, but it’s worth considering. Noticeable damage and defects can be bargaining points. There are a few advantages in buying from a dealer. You have the protection of a warranty, usually three to six months. They will usually be serviced, tested, have an RWC and the documentation will be done for you. There is always the possibility of trading in your existing bike. It will save you the hassles of selling privately. Generally, you will get a better trade in price if you are looking to buy your new bike from them. This is a definite bonus. You will have somewhere you can trust to take your bike for repairs, tuning or service. You also have the possibility of trading it back to them when you are ready for your next bike. If you need to borrow for the purchase, this can be a big advantage. It works both ways though as you will be committed to making payments on time. In Australia, the “Cooling Off” period is usually 30 days for retail sales and contracts. You can back out of the deal at any time during this period. 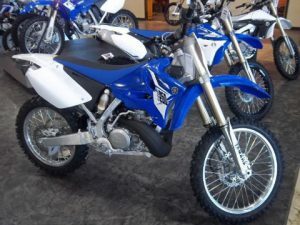 The product must be returned in the same condition as when it was sold, which may be a problem with a dirt bike if you have ridden it. Fees and charges may apply. There are also a few disadvantages in buying from a dealer. This is the tradeoff when buying from a dealer. There is the potentially cheaper purchase price with a private sale and its risks, against the higher dealer purchase price, but the added protection of warranties and “cooling off” periods. You need to be aware of “up-selling” which they will almost always try to do. It is sales after all. If you are borrowing money they will try to talk you into a more expensive bike. Tip – Give yourself some leverage. Go around to a few other dealers who have the bike you’re looking for and take note of the model and price. Then when you go to the other dealer you can say “I’m going to buy ** bike from ** dealer for $***. Can you do a better deal? You have the upper hand now because they know if they can’t do better you’ll go to their competitor. They’re always open to negotiation if they can steal a sale from a competitor. Facebook Marketplace – Can be accessed through the Facebook App on your phone. You can set up alerts so that you’ll be notified when a new listing matching your search is posted. Craigslist – This is the most common place to look online. You can download the mobile app on your phone called CPlus which lets you set up alerts to get notified of new posts, just like Facebook Marketplace. Cycle Trader – (US) This site is worth a look to get an idea of what your particular bike is selling for. You can narrow the search down to within a specified radius of your location. A lot of dealers use this site. The local MX track – If you’re buying a used motocross bike, check out the bulletin board at your local club. There will generally be for-sale ads there. Talk to people, someone may know someone who is selling a suitable bike. If it’s a kid’s bike you’re looking for, there will be bikes for sale when a child has grown out of there current bike and is upsizing. 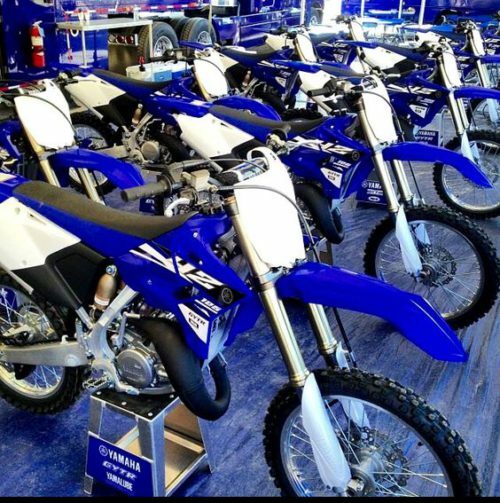 Online Dirt Bike Forums – There is often a for sale section here, but as with any online purchases, be vigilant. There should be photos, specs, make, model, year etc. Dirt bikes come with a VIN number which can be checked online for a small fee. If you’re a parent buying a bike for a child and know nothing about dirt bikes, take a trusted friend or mechanic with some knowledge. Obviously, the only way you can really determine the bike’s condition is to whip the head off and split the cases, but as you can’t do that, there are still some things you can check without any tools. Bringing a friend along can also be really helpful as you will have someone to chat with the seller while the other checks out the bike. Another pair of eyes can be really useful and they can remind you if you’ve forgotten to check something. Always arrange to see the bike in broad daylight or a well-lit environment, rather than a dimly lit garage. The obvious things – If the bike is still dirty from the last ride, don’t even bother looking further. If the owner can’t even take the time to make it presentable, chances are they’ve been equally lazy about looking after the bike. It’s fair to expect that the bike may have some dents, scratches, worn paint etc. It’s a dirt bike and they get a pretty hard life if they’ve used off-road a lot. These are really just cosmetic, but they do seriously affect the market value when it comes time for you to sell it. A torn seat scratched plastics, bent handlebars all contribute to reducing it’s value. Bent footpegs mean the bike has been stacked a few times. Plastics and seat – Cracked plastics behind the seat indicate the bike has been flipped over backwards. Check for missing fixing screws, and cracks in plastic around the fixings. Cracked plastics or torn seat are by no means a deal breaker. Replacement plastics are about $100 for a full set and seat cover can cost about $50. Engine – Look for signs of recent work. If the engine is extremely clean, but the rest of the bike isn’t, this could mean the engine has recently been removed for work. Look for signs of oil leaks, especially around the clutch cover gasket, and engine covers to the crankcase. Also cylinder base and head gaskets. Engine Oil – Start the engine, let it run for a few minutes and then turn it off. Open the filler cap and stick a twisted piece of tissue paper into the filler hole. Look out for fine metallic particles in the oil. The oil should be fairly clear and not dark and burnt brown looking. Check that the oil level in the inspection glass is where it should be. ANY metallic particles mean the engine is not in good shape. You don’t want to be paying for someone else’s negligence. It might pay to look no further if the engine is due for major work. 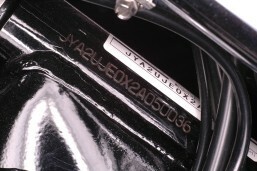 Chassis & Engine numbers – The VIN number is usually located on the steering head. Check that they’re not scratched off or missing. It could indicate a stolen bike. Look for signs of being tampered with. Frame – Look over for cracks or signs of new welding. Look closely at the weld joints at the steering head and gussets, and at the frame cradle in front of the footpegs. Look underneath the frame cradle for cracks. Another stress point is the welds near the top of the rear shock. Check the aluminum swingarm for cracks near the rear axle mounts and at the swingarm pivot point. Electrical wiring – Check for worn electrical cables that rub against the engine or frame. Insulation tape over wiring is a sure sign of a quick fix. Chain and Sprockets – Check the wear on the front and rear sprockets. Hooked shape teeth indicate severe wear. A quick easy check is to pull the chain away from the rear sprocket with your fingers. If it comes away more than a couple of millimeters, it could need replacing. You always replace the sprockets and chain together, so if you see a new chain, check that the sprockets are also new. Also, check the tension adjustment. If it’s not adjusted correctly, chances are it’s worn also. 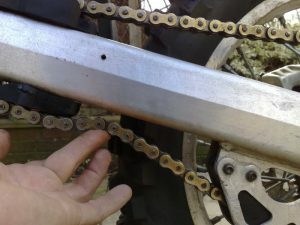 There should be 8 – 10mm clearance between the chain and swingarm as in the picture below. Brakes – Check discs for grooves where the pads touch. Also, check how much meat is left on the pads. 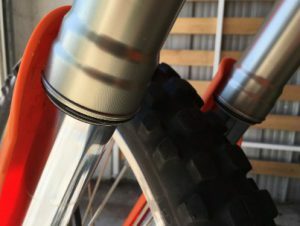 Kick Starter – Is it sloppy, or cracked around the pivot bearing. Check the oil seal around the shaft for leaks. Radiator – Open the cap and check coolant level. It should be covering the fins. Look over the hoses for cracks or leaks. Check radiator fins for bends or dents. Swingarm bearing – Put the bike on its stand with the rear wheel suspended. Grab the frame with one hand and the back of the rear wheel on the tire and try to move the wheel side to side. It shouldn’t move more than about 5mm. Wheel bearings – With the rear wheel still suspended, grab the tire at opposite sides of the wheel and try to rock it sideways. There should be no movement. Do the same with the front wheel suspended. Steering head bearings – With the front wheel still suspended, grab the lower fork legs and check for movement forward to backward. There should be no movement. Wheels and Tires – While the wheels are suspended spin them and check for cracks and buckled or dented rims and bent spokes. It usually means the bike has had a stack or two. Fork Seals – This is pretty evident if the lower fork legs, the inner tubes have oil on them. Check out my post ‘How To clean Leaky Fork Seals‘. A small leak may not mean that the seals need replacing. Look around the seller’s garage and the state of the house in general. If the garage is a mess and the house is not well maintained, chances are they have also been lazy about maintenance on the bike. If you’re still interested in buying it, time to take it for a spin. If the bike is unregistered, and they live in a built-up area, this may not always be possible. You may have to meet somewhere where you can ride off road for a short distance. Many things only become apparent when you start the bike and take it for a test ride. There are some things you can check even without taking it for a ride. 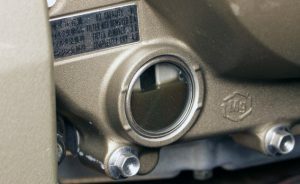 Engine compression – You can get a good idea of the compression without doing the full compression test just by kick-starting the bike. If this is your first bike, this is where an experienced friend comes in handy. This will give you a good idea of whether the piston rings need replacing. Do it again when the engine is warm, the compression should feel the same as when it is cold. Listen for engine noises – Tapping or rattling noises near the top of the engine (if it is a four stroke) could indicate worn timing chain and camshafts, or valves and piston rings. Tapping noises from the bottom of the engine indicate worn crankshaft and related bearings. Bigger money for repairs than top end. Riding the bike – Depending on where you are riding, try to go through all the gears to check none of them are slipping out or sticking. Clunky gear changes are a sure sign of wear. Check the bike is running smoothly under acceleration, as this is when any misfires become evident. Give it a handful. Check the clutch isn’t slipping under acceleration. Make sure the front and rear shocks are not spongy or springy and the damping is working. You have to go over a few bumps to get an idea. Check how the brakes work under heavy braking. Fortunately, worn brakes aren’t expensive to fix. If you are happy with the rideability and performance, and everything else checks out, it may be time to make an offer. Good luck and happy riding. This video goes into more detail of things to check during your inspection. It could save you some money and put the odds in your favor. I’d recommend watching it before you do your inspection. Don’t feel pressured to buy the first bike you see. The perfect bike for you may come available next week. When buying a used dirt bike, patience wins out in the end. 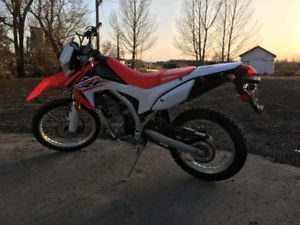 Do you have any good tips for buyers looking for a used dirt bike? Have you had any bad experiences, or bought a lemon. Feel free to leave your thoughts below. Awesome advice, thanks for this! I’ve been keeping an eye out for both street bikes and dirt bikes recently, and I’ve seen so many good sounding deals on the app LetGo… but I’ve been too paranoid about being hoodwinked to actually contact anyone. These are all great tips that I’ll need to keep in mind. It would be my first time buying one used. Is there any way of protecting yourself in a worse-case scenario? Like if you ended up finding major issues wrong with the bike after purchasing, can you take the sellers driver’s license info or something that would make it impossible for them to avoid your inquiries? Hi Jordan, thanks for your comments. Yes, by all means get the seller’s contact details, you will need to see the proof of ownership documents anyway, which will have all their details. If buying an unregistered bike in a private sale, it is a case of buyer beware, so it is even more important to do the checks I mentioned in the post. If this is your first used bike purchase, and you are really worried about it, the safer option is to buy from a dealer, then you will get a warranty, after sale service, and some comeback if there is a problem. There is always that risk factor in a private sale. Most people aren’t out to rip you off, but it is always a risk. I must have bought about 20 bikes used and have never had a problem. If you know a bike mechanic that will come with you, it’s a big help. All the best with your purchase.